Sonoma, California – It’s a May to December marriage. So let’s dish. Deep dish, that is. A dearly beloved winter comfort food – sweet warm bread pudding – just got hitched to a fresh luscious summer-loving fruit – blueberries. Thanks to an abundant supply of fresh blueberries from Chile, Americans can now enjoy this tasty berry all winter long. That’s because it’s summer in Chile when it’s winter here. Fresh whole blueberries sparkle like jewels in a crown amid pillowy mounds of vanilla-scented custard-drenched bread dough in this brand new delectable dessert recipe. Best of all, it looks and tastes like a lot more work than it really is. 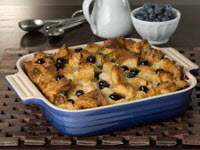 Simply cut the French bread into squares, add to the custard ingredients and top with fresh blueberries. Fresh blueberries require no chopping, peeling or pitting. Just rinse and they’re good to go. In large mixing bowl whisk together milk, eggs, sugar, vanilla, cinnamon and salt. Let sit for 30 minutes to 2 hours. Add blueberries. Pour mixture into a buttered 9 x 9-inch ovenproof dish. Top with bits of remaining butter. Bake in a preheated 350 degree oven for 45-55 minutes or until the custard is set.